Our “little” one… 95 m2 that can host 4 guests. Extending in a ground floor it consists of a living room, a kitchen, 2 bedrooms and 2 bathrooms. It stands out thanks to its tall wooden roofs, the minimal decoration and its romantic atmosphere. Built at the highest point of the property, in direct contact with the neighbouring wood, the surrounding area and the pool, gives the guests the feeling of having everything close at hand. Nevertheless, if you want to dive in the sea, an impressive stone stair leads you to the small beach with the blue-green water. At the south part of Lefkada island, 30 km from the city, built at the deepest recess of a bay, Sivota fishing village charms all the visitors. When the small marina is full, the sailing boats moor “arodo” (means off-shore), creating a magnificent scenery. Inside an olive field, at the edge of the village, in front of the small beach, we created “ARODO | SEASIDE VILLAS”: A independent, luxury villa with private pool. There are excellent views across to the bay of Sivota and as all amenities are within 100m car hire is not necessary. The villa has been recently completed to very high standards. “Arodo” offers crystal blue waters, unspoilt nature, calmness, comforts and luxury. A peaceful shelter for unforgettable holidays. My husband and I are civil engineers. We come from Lefkas, Ionian Islands and we live in Athens. We have always wanted a beautiful holiday house at our hometown. So, we built “ARODO | SEASIDE VILLAS”. We named the villas after our daughters Christina and Penelope - in the meantime we have one more daughter, Vasiliki, but no other villa. We are proud to have used a lot of our energy, personal taste and technical knowlegde in completing “ARODO | SEASIDE VILLAS”. We are very positive that our guests enjoy our villas as much as we do every summer. The land was passed down through our parents and we felt we had an obligation to take full advantage of it. Late in the evenings, we enjoy a lot, among others, the view of the sailing boats return to their base, while we are having a drink by the pool. It's so lively and tranquil together. It makes me wonder of how lucky we all are being able to enjoy such beautiful surroundings. A fantastic location, with amazing views yet close to beach and beautiful fishing bay. Villa Penelope is in a great location. The views are fantastic of the pretty harbour with the mountainous backdrop, whilst being so close to the beach, tavernas and bay. The villa itself is faultless - all that we needed as a family of four. It is completely private too. The children loved the pool , as did we! It was such a relaxing holiday , centred around the pool and having brunch/lunch and supper at the very good tavernas just a short stroll away (5minutes) with fresh fish every day. We would definitely recommend this villa . Perfect location. Private but very close to the village. The villa is well equipped and laid out. Sivota is charming enough but Villa Penelope positioned at the very end of the bay enjoys a great position. Great view across the bay to the tavernas yet a 10 minute stroll past the Marina and you are there. Added to that it is a charming building next door to its bigger sister Christina. The pool is lovely and everything you'd want is provided. We really enjoyed our stay and would return in a heart beat with no worries. Villa PeneIope is a wonderful villa in an idyllic spot. It is everything it says on the details and more. We thoroughly enjoyed all the bars and restaurants in Sivota and the towns close by. We didn’t have the best of weather all of the time, but that really didn’t matter because Villa Penelope is a fabulous place to spend time and relax and watching the thunder and ligthning storms from the living room was astonishing. The village of Sivota is excellent for eating, and is so reasonabaly priced. The people were so friendly making us feel at home. In particular the Yacht Bar where they accomodated us with the 2015RWC. The villa itself is high quality, well maintained and well laid out, it has everything you need. We enjoyed our holiday so much we are booking again for next June. Wish I was the owner of such amazing property! Undoubtedtly, Villa Penelope was one of the most beautuful villas that we have ever been to. And we have very high expectations from the properties that we book. Its not easy to describe the feeling that the villa and its amazing location offer you. The architecture of the villa is great, for a familly of 4 it is very comfortable and ergonomic. The swimming pool is lovely with the perfect size for the whole family to play inside. The fact that you have everything within reach by foot, just by going down the stone stair and walking towards the center, it is priceless, while at the same time you feel totally isolated and no one can see you, and you have all the privacy that you could need. I really was amazed by Villa Penelope. The amenities covered our needs, we enjoyed the BBQ outside, and overall we had a great stay that I wish would have lasted longer than a week. 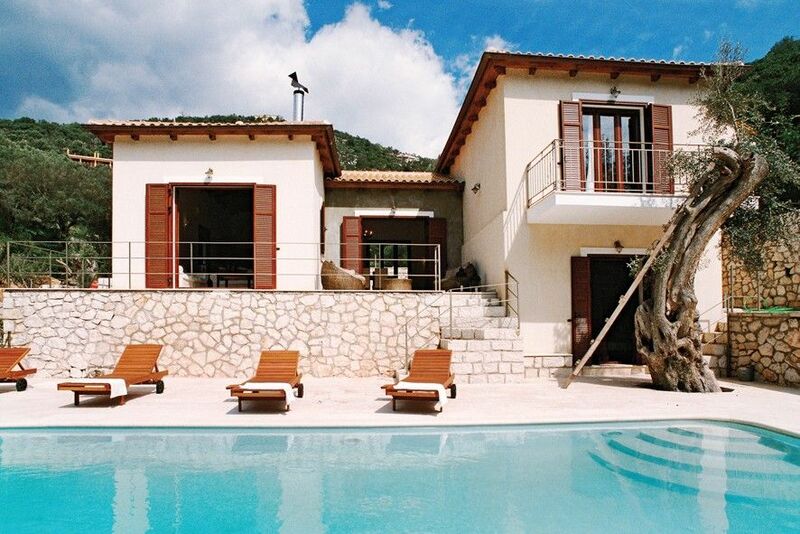 Villa Penelope is an absolutely wonderful property in the quiet village of Sivota. As a family of four, with one teenager and one toddler, we had a fantastic one-week stay and would love to come back again. The villa matches the pictures and description on the website and is very stylish, comfortable, and well-maintained. Its perfect location guarantees absolute privacy, even from the neighbouring villa, whilst at the same time offering a lovely view over Sivota bay and the marina. Driving from Bulgaria, we easily found the property by following the directions that Maria, the owner, had emailed us in advance. The next day we met the property managers Marino and Beate, who kindly brought us a baby-cot after we had forgotten to specify we would need one. They came once more during our stay to clean the pool, and were very friendly and helpful. Before our departure, Maria had also emailed us some recommendations for restaurants, shops and things to see in the area (all with clear directions) and we enjoyed trying out the local restaurants in Sivota villlage. The food was excellent in all of them, but we particularly liked the restaurant closest to us, the Ionian tavern. The village also has some nice places for breakfast or a morning coffee, and a few bars for a drink at night, all very pleasant and lively. If you have a car, Sivota is a perfect starting point for exploring the island and its wonderful beaches. For us, however, the quiet and comfort of the villa, the view, the wonderful pool, and the village at walking distance meant we mostly stayed in Sivota. We had a very comfortable and relaxing stay in villa Penelope, and hope to be back here again in future. Sivota bay is a lush green area that charms the visitor by the first glimpse. The bay is a safe natural anchorage, very popular with yachts. When the small marina is full the yachts moor 'arodo' (means off-shore) creating a magnificent scenery. Sivota fishing village has all the amenities for relaxed self-catering holidays. There are several restaurants and cafés, a supermarket, a pebbly beach all surrounded by great nature. All together can keep the visitor busy for several days and a car hire is not essential. At the west side of Lefkada island there is a series of breathtaking beaches with crystal blue water. Famous beaches like Porto Katsiki, Egremni and Kathisma will never disappoint the visitor. Vassiliki, a paradise for wind/kite surfing enthusiasts, is only 10 km from Sivota. The idyllic bays of Lefkada and the little islands around are the perfect sailing waters. Sivota has a small marina and a boat slip to satisfy those very keen on sailing and boating.